In the Dungeons & Dragons: Temple of Elemental Evil Board Game, you play as aheroic adventurer. With amazing abilities, spells and magic weapons, you mustexplore the dungeons beneath the Sword Coast where you will fight monsters,overcome hazards and find treasure. Are you ready for adventure? 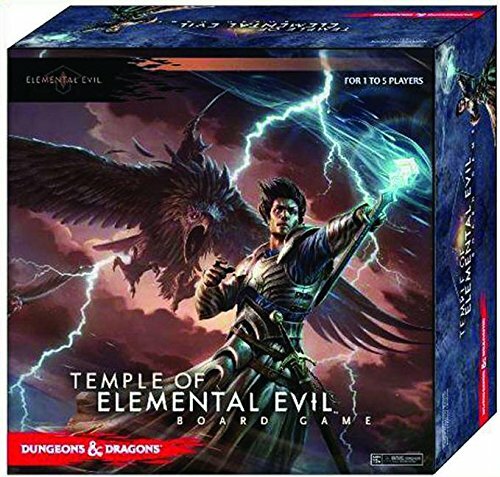 Temple ofElemental Evil includes multiple scenarios, challenging quests, and co-operative game play designed for 1-5 players. The contents can also becombined with other D&D; Adventure System Cooperative play board games,including The Legend of Drizzt and Castle Ravenloft. Each player selects ahero, such as a fighter, cleric, or wizard. On their turn, each player canexplore further into the dungeon (turn over new tiles), move through thealready explored parts of the dungeon, and fight monsters. When a new dungeontile is revealed, there is typically an encounter of some sort, and newmonsters to fight are added. Slain monsters reward the players with treasure,and experience points, allowing them to level up and increase their skillsduring play. Players must cooperate to stay alive, slay the monsters, andachieve the goal of their quest. Each scenario has a different goal, fromretrieving a relic to slaying a large boss monster.